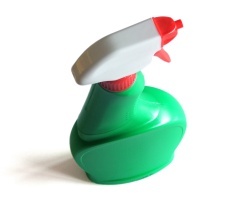 How can I reuse or recycle a Cillit Bang spray bottle? | How can I recycle this? How can I reuse or recycle a Cillit Bang spray bottle? 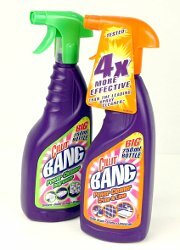 How can I reuse a Cillit Bang spray? It seems impossible to remove the nozzle to fill with a product. I’ve never used it so I don’t know what the bottle is like – but I’m going out to the shops in a few minutes so I’ll have a good look at one (that’s guaranteed to get me some weird looks in the cleaning aisle ;) ). I’ll also check what type of plastic it is for recycling purposes (my guess would be HDPE, plastic number 2, which is widely recycled, but I’ll check). We’ve covered pump action spray bottles before – people reuse them as plant spritzers or personal misters, or refill them with vinegar or homemade cleaning solutions to make their own cleaning sprays — but all of those reuses require getting into the bottle again. Anyone got any helpful hints on how to remove the nozzle section from a Cillit Bang bottle without breaking it? Any other reuse ideas for if the nozzle section is stuck on? If you can’t unscrew the nozzle you could just cut a smallish hole near the base of the nozzle and use that to fill the bottle with something else. You’d have to be careful not to knock it over as it would spill out of the hole, but it’d be fine for spraying aphids with soapy water or that sort of thing. Maybe not so good for things where you need to hold the bottle at a bit of an angle, but pump action sprays only work when the bottom of the tube inside is below the level of the liquid anyway, so they’re not ideal for using in a non-upright position even when you can get the nozzle off. The bottles are HDPE – plastic number 2 – as I suspected so are widely collected for recycling. Shelagh is right about it being difficult to remove the top nozzle section – most screw on at the neck but this one seemed like it would twist on then clunk into place behind a wedge/lock, making it hard to open again. I like Alice’s idea of cutting a hole to refill it – a drill/hand drill would probably be the easiest way to do that. You can close the hole you drill with a little rubber stopper or cork. They are available at craft & hardware stores (DIY, ironmongers), but you could carefully trim down an old wine cork, instead. Hi, the cillit bang bottle may be recyclable, but the spray nozzles of all these containers are not. For information, my ex managed to get the nozzle off, so maybe ask someone with brute force to have a go? Then try switching the nozzle for another from another bottle. I’m sure they are inter-changeable. Yes, Sher is right! I’m a brute and used force and it came off! You have to pull hard on head and rock side to side at the same time. I was successful in brutalizing and reusing it. I’ve been trying for about 10 minutes how to figure out how to take this thing off so I can re-use it. The moment I read your comment I just pulled it straight off quite easily. Thank you for the ‘brute force’ advice. I decided to go heavy handed, flipped the orange top back and stuck a knife under the white plastic and managed to prise it off and refill.. SUCCESS at alast!!!! They should make it easier though especially as they sell refills!!!!! Brute force here too, thanks! Recycling aside for the moment, I bought a Cillit Bang spray bottle and can’t seem to figure out how to put it in action (to make it spray out). What else do I have to open? ‘Cause it feels like some “orifice” is still closed…! Hi Karen, Did you get any replies ?I have just bought a bottle and have exactly the same problem as you! Very frustrating. Yep. Brute force here too. Twist it back and forth, pulling very hard. It will come off over the concentric rings, being just the reverse procedure of the machine that fitted it in the first place. It will deform the plastic of the neck, but no matter, top should bang back on again just as before, may not be quite watertight though. Same procedure to get top off a new extra size ‘economy’ bottle, to refill one of a convenient size for the sink top. But … pull it off in an empty sink bowl. Then if you do spill it, you can recover some of it. Brute force and strong hands again I’m afraid. Perhaps a stiff-bladed dinner knife might help, but again, take care, blade side AWAY from you. Supposed to be childproof !? Damned near grandad proof !! These things should be banned. I will not buy another product using one, since they are designed for single use & then only consigned to landfill as they are not recyclable. Got it off, Just ease the very bottom all the way round with a screwdriver ,then apply a bit of brute force rocking side to side and re-use , you probably could only do this once and reuse it. hope this helps someone. sakes ! Lease wise that’s what my ole grandpppy used ta say.